In the 1850s, the Namasket Gazette featured a number of items about the Nemasket Hill Cemetery, then also commonly known as Burying Hill. Like other cemeteries of the era, Nemasket Hill was largely neglected, visited only infrequently when a body was interred. Consequently, it remained unkempt, and the lack of fencing invited livestock to roam the site. Increasingly calls were heard for an improvement in the cemetery as well as the erection of a well needed fence. The first published item making such demands appeared in the newspaper on March 18, 1853. MR. PRINTER.- Please give this a place in your paper:- As I was going from Middleboro’ to T., in June last, I went by a grave yard in R., and as I passed it, I was much pleased to see that the lot was enclosed with a handsome stone wall, and also that handsome evergreen of the forest, the fir, ornamented, as it waved over, every mound, and with the addition of flowers of variegated hues, made it very pleasant to look upon. As I passed onward, I thought of the old Burying Hill in M.- for it is there my friends and kindred dwell. This hill is situated on the north side of Namasket River, having a full view of the broad flowing stream below, and also of that flourishing village, the Four Corners. Here lay a large congregation of both old and young; among others, the remains of Rev. Mr. Fuller, who was the first minister settled in this town. Quite a portion of the hill is covered with graves, which are overgrown with brush and scrubby trees. The monuments now standing, are in danger of being rubbed down, as cattle, sheep and horses, patrol the hill at pleasure. Stone posts were erected two or more years ago, with eyes set in them for the purpose of receiving iron rods as I suppose – but nothing more was done. R. Tinkham, Esq., has, as I learn, recently built a tomb, ornamental to the ground, and individuals have made considerable effort to get a permanent fence – but they appear to have retired, discouraged. Now as the season is approaching, when the thing can and should be done, I hope those who have any regard for the memory of the dead, will put their shoulders to the wheel and help roll it forward that the ashes of our deceased friends may be protected from the beasts of the earth, and the living may not have the finger of scorn pointed at them for neglecting their duty. Life is the time to do this. T.
Seven months later a similar appeal was published on September 9, 1853, by a Muttock resident known simply as "Warren". The September writer also called for a fence, and noted the decaying stones, many of which had been damaged by livestock as noted by the previous writer. In addition to the preservation of the existing stones, the placement of new memorials honoring the earliest residents interred in the cemetery was suggested. In addition to these practical measures, "Warren" also wrote idyllically of the site's beauty, though revealing a narrow mid-19th century conception of Native history. Ultimately, however, the piece became a rumination on life and death for the writer. The subject of this sketch, is the oldest burial place in this town: where, beneath the turf are mouldering back to dust, its first civilized inhabitants; those who first felled the trees, tilled the soil, reared habitations, sowed the seed of improvement and civilizations and to whose earnest endeavors we owe not a few of the many blessings which we now enjoy. Among the oldest stones, is one erected to the memory of GEORGE VAUGHAN, who died 1694 at the age of 73 years: also his wife, ELIZABETH, the same year; another to the memory of Lieut. JOHN TOMSON, who died in 1696, in his 80th year. There are a few apparently older, but it is impossible to distinguish the date or anything originally inscribed to the memory of those who lie beneath, as some have crumbled to pieces, and others lie broken on the ground. It would be a noble act of disinterestedness, and one which posterity would hold in kind remembrance, if the present generation should erect a suitable monument to the memory of the early settlers whose names are yet to be found in this hallowed spot. The stones that now mark their last resting places are crumbling, and soon there will be nothing to remind us of those men who, surrounded by Indians whose shrill war-whoop sounded through the forests, and the scarce more savage beasts that howled mightily around their dwellings, contributed to laying the foundation of this, then infant colony. While standing amid the lonely tomb-stones of the departed ones of earth, our imagination carries us back to the time when all who lie buried here, moved in the busy throng of life. Again memory recalls the loved forms of those of our own times, which seem to throng around us once more, their familiar faces beaming with smiles, as in days gone by. Now that imagination has had its flight, we will mark the beauties that surround the spot, where we have often rambled, and which we now review with emotions of pleasure. The hill ascends from the river side, in some parts gradually, and others abruptly, densely covered with pines and the sweeping birch, intermingled with brambles and gnarled oaks; nearer the river, forming a fine shade from the sun, are trees among whose leafy branches are heard the rich and mellow tones of the forest songsters; farther down even to the waters edge, overhanging the river, whose gurgling sound is heard as if grumbling with discontent as the rocky bed o’er which runs its shallow waters, are trees whose trunks and branches climb with grape vines whose fruit lies ripening in the summer’s sun. Standing on this beautiful eminence we have a fine prospect of the surrounding country. On one hand is the “Four Corners,” its church spires rising, one on the east and another on the west part of the village, which is here presented to view. Farther to the south-east, partly hidden from our sight by the denseness of the surrounding foliage, are seen the villages, if they may be termed, of Upper and Lower Factory; then turning towards the west, while the eye follows the windings of the Namasket’s tranquil stream, until it rests upon a basin of water commonly termed the “pond,” which is however partly hid from view by “Oliver’s Walk.” At last, though not least, comes Namasket Village with its dwelling houses scattered here and there, while on a little eminence rising quite conspicuously the village school house; looking still farther to the westward, taking in with one sweep of the eye the gentle undulations of the wooded country, and in the distance as far as the eye can discern are seen the spires of neighboring towns and villages. Three weeks later, on September 30, 1853, still yet another piece featured Nemasket Hill Cemetery, its author observing it from the south bank of the river. Right opposite me is the “Hill Burying Ground,” as I can see by an occasional white head-stone among the thickening pines. A correspondent of yours has recently suggested that some self-sacrificing being, like the good “Old Mortality,” would confer a favor by putting some of the monuments into a better shape for perpetuating the records inscribed on them in the earliest days of the country’s history. While little was done to preserve the gravestones as suggested by the last two writers, the proprietors of the cemetery ultimately did have the property fenced. As indicated by the first author, T, the proprietors had installed granite posts in the early 1850s, if not earlier, but did not complete the task of fencing the cemetery. 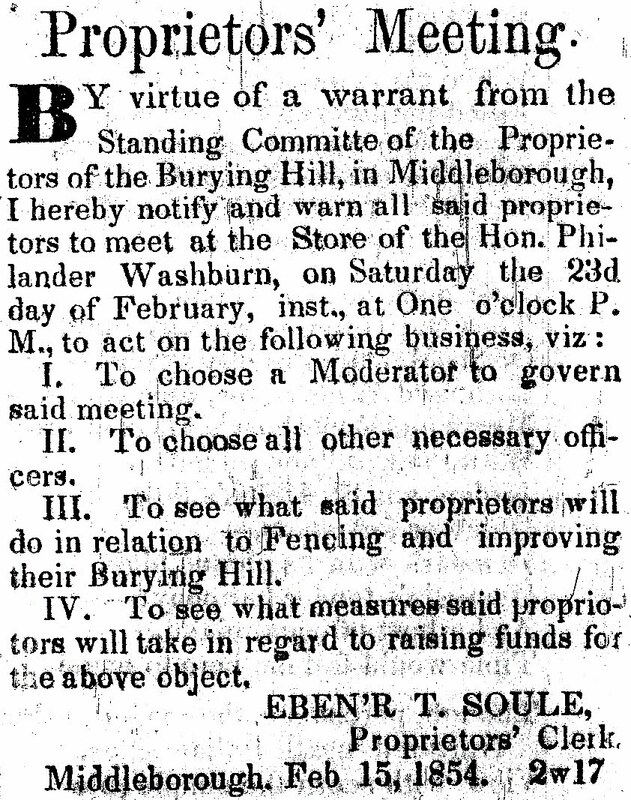 On February 23, 1854, the proprietors met at the store of Philander Washburn at Muttock "to see what said proprietors will do in relation to Fencing and improving their Burying Hill." Once more, little action seems to have been taken for it is not until October, 1856, that it was reported that positive steps were to be undertaken to improve the cemetery. 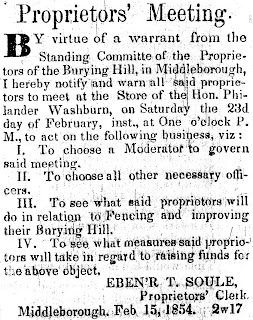 At a meeting of the Proprietors of the Burying Hill, held at P. Washburn's store, on Wednesday last [October 15, 1856], it was voted to raise money by subscription for the purpose of fencing the grounds. A committee was chosen to lay out the grounds. A committee was also chosen to purchase the iron and build the fence forthwith. The vote would mark the beginning of the transformation of Nemasket Hill Cemetery from a neglected burying ground to a modern landscaped cemetery. In the brief interlude between late 1856 and May, 1860, much improvement was made as indicated by the report of a visit made in the latter month. We recently visited the grounds of the old cemetery that contains the dust of the first minister and first settlers of Middleboro. Its location is extremely fine, commanding an extensive view on either side and exhibiting every variety of scenery. The Namasket River makes a bend apparently to kiss the base of the hill which rises some two hundred feet from the glassy waters. The whole field including some twenty acres has been recently enclosed with stone posts and iron rods. Its massive granite posts at the entrance appear as though they might stand for ages. Mr. Abial Washburn's yard has been enclosed and adorned with trees, flowers, and elegant monuments. Mr. Alexander Wood, Mr. Wm. Bourne Wood and Mr. Alfred Wood are now engaged in grading and fencing plats for family use, at an expense of some $200 each. We are glad to learn that the Wood family intend soon to erect a monument, on the summit of the Hill, of such altitude as may be seen at a distance, to the memory of their ancestor [Henry Wood], who first settled at Middleboro, and built one of the first twohouses in this place. This will be a worthy undertaking and will doubtless inspire other families to do likewise. "Elizabeth Vaughan, aged 62 years or thereabout, departed this life June 24, 1693." "George Vaughan, aged 73, departed this life October the 20th, 1694." The third in age is that of Rev. Samuel Fuller, first minister of the place, and the fourth is that of John Thompson. A visit to these grounds is well worth the time. Some relics which have been found there in grading the lot of Mr. W. B. Wood, seem to indicate that this was probably an Indian Cemetery, when the pilgrims settled here. While the anonymous author of the appeal to the Namasket Gazette in March, 1853, urged those with "regard for the memory of the dead" to protect Nemasket Hill Cemetery's "crumbling" slate stones from damage, the monuments continued to decay and wear away. Many of the original stones are no longer present, with only a few remaining in a legible condition. Heeding the call of an earlier generation, the resting places of some of the most prominent among those interred in the cemetery, such as John Tomson, have been marked with recreated stones. Beginning with this meeting in early 1854, the proprietors of the Nemasket Hill Cemetery began to take a more proactive approach in their care of the cemetery. Within a few years, the cemetery would be enclosed within a granite and iron fence, and various other improvements would be made. The work inaugurated at this time was reflective of the rural cemetery movement and it would transform Nemasket Hill Cemetery from a relatively barren burying ground where livestock roamed, to a beautiful garden-like cemetery where Victorian families could enjoy an outing amidst beautiful natural surroundings. While the Wood family owned a number of lots at the summit of Nemasket Hill and intended to erect upon them a monument to their ancestor Henry Wood which would have been visible for a considerable distance, they never did. Instead, Alexander and Alfred Wood placed granite obelisks on their adjoining plots, while in 1906, the family of William Bourne Wood had a 16-crypt mausoleum constructed of Fall River granite across the carriageway from the two obelisks. 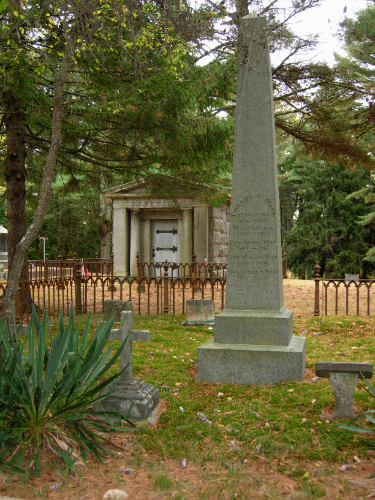 The mausoleum, with an interior finished in marble, is one of Nemasket Hill Cemetery's most notable man-made features. Middleborough Gazette and Old Colony Advertiser, "Old Cemetery on the Hill", May 19, 1860, page 2. Namasket Gazette, “The Old Burying Hill in Middleboro’.”, March 18, 1853, page 1; “Burying Hill”, September 9, 1853, page 1; “Letter Written on a Rock”, September 30, 1853, page 1; "Proprietors' Meeting", February 17, 1854, page 2 [advertisement]; "A Meeting of the Proprietors of the Burying Hill ...", October 10, 1856, p. 2 [advertisement]; October 17, 1856, page 2.